Effect Gizmo | RJM Music Technology, Inc. The ultimate loop switching solution. Durable metal construction, built for the road! The Effect Gizmo is a programmable true bypass loop switcher. With this switcher, you can take control of up to twelve pedals or effects processors and can control them from any MIDI controller. Turn on any group of pedals with a single button press! You can define up to 256 presets, each of which can turn on any or all of the connected pedals. With its clean, transparent sounding audio path, acclaimed buffer circuit and road-worthy construction, it’s easy to see why the Effect Gizmo is being used by so many big name touring bands! 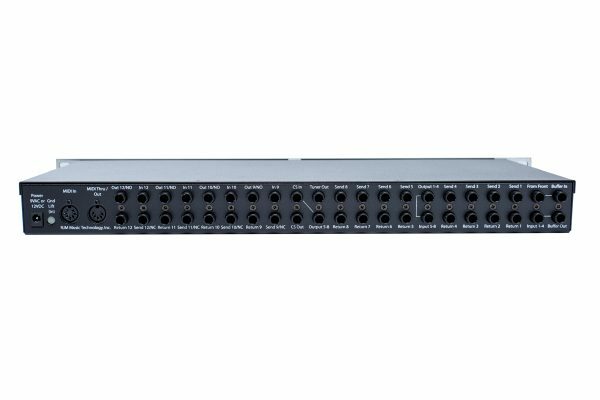 The Effect Gizmo is a rack mountable MIDI controllable 12 loop audio switcher. You can use the Effect Gizmo to control your pedals with any midi controller, either in a rack setup or on your pedalboard. A single button press on your MIDI controller can turn on any of the pedals connected to the Effect Gizmo, making it a lot easier to manage your effects. You can also program the Effect Gizmo to change channels on certain amps and engage various functions on pedals that have ¼-inch switching inputs. How difficult is the Effect Gizmo to setup/program on my own? The Effect Gizmo extremely simple to set up. Plug your effects pedals into the Effect Gizmo and turn on all your pedals and you are set. The Effect Gizmo will switch your pedal(s) in and out of your signal path depending on how you program it. Programming is as simple as selecting a preset on your MIDI controller, using the Effect Gizmo buttons to turn on the desired loops, and holding the Write button to store those settings. This can be repeated for up to 128 presets. Is the Effect Gizmo “True Bypass”? Is the MIDI Effect Gizmo compatible with______? The Effect Gizmo is compatible with any MIDI controller on the market, but it pairs extremely well with either our Mastermind GT or Mastermind LT.
Visit our online store to order your Effect Gizmo today!